During the checking of said vehicle eight sachets of pink-coloured powder were found from underneath the floor mats of the car. Mahadevpur police arrested three persons and recovered of contraband drugs from their vehicle at the Dirak gate here in Namsai district on Wednesday. After receiving a tip-off about some persons carrying suspected contraband drugs in a white Santro car, the local police immediately alerted police team at the Dirak check gate, and they intercepted the car on arrival,”, said police sources. During the checking of said vehicle eight sachets of pink-coloured powder (suspected adulterated brown sugar) were found from underneath the floor mats of the car. police informed EAC W Mosang, and recovered the suspected brown sugar under his supervision. The car has also been taken in police custody and the three people have been arrested, police informed. The three arrested persons have been identified as Krishna Shah (vehicle owner) from Doom Dooma, and Sumitra Chakma and Budista Chakma from Diyun. 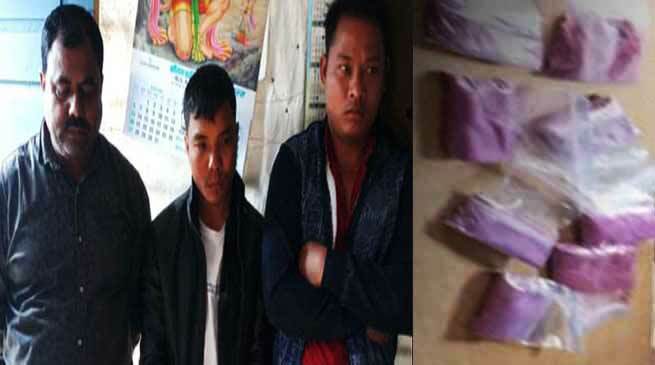 On inquiry it was found that the drugs had been brought from Tinsukia and were being taken to Namsai and Diyun areas. A case has been registered under section 21 (c) of the Narcotic Drugs and Psychotropic Substances Act at the Mahadevpur police station. The police team in the recovery also included head constables DK Singh, JP Tiwari, AK Singh, and cadets CM Mein and P Tikhak.